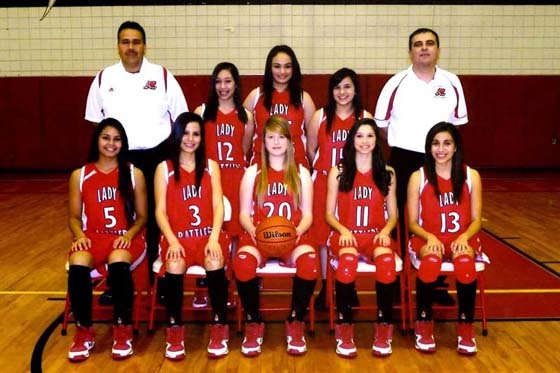 Rio Grande City High School Varsity Basketball Lady Rattlers had a strong finish to their season this year. Coach Compean and Coach Valenciana would like to thank the girls for their hard work, effort and dedication to the sport. A few of the girls on the team will be returning next year and are looking forward to an even better season. Pictured left to right are; (Top) Coach Compean, Monique Diaz, Mayra Garcia, Alexis Bazan and Coach Valenciana. (Bottom) Joelda Olivarez, Ana Laura Pruneda, Kelly Alderman, Cassandra Guerra, and Daniela Garza. RGCCISD.